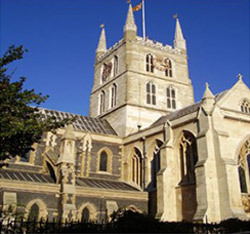 On Thursday (21st Nov 2013) Her Majesty the Queen and His Royal Highness the Duke of Edinburgh visited Southwark Cathedral in which Norman & Underwood are currently working on re-roofing the South Nave Aisle, North Transept, Harvard Chapel (all lead) and North Choir Aisle (copper), including timber substructure repairs and stone masonry conservation works. Pupils from the nearby school greeted the Royal Party with cheers and flags as they made their way up and into the cathedral. A red carpet had been laid down the main walkway for the Royals to walk down. The Queen was shown the cathedrals Diamond Jubilee Window for the first time in which she also met the windows artist Leifur Breidfjord from Iceland. His window artwork is also being presented on this years Christmas stamps. 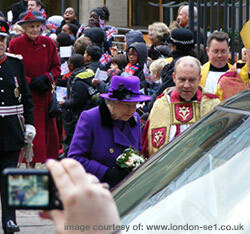 The Queen and TDOE both left the cathedral as the choir sang ‘The Lord bless you and keep you’ by John Rutter.